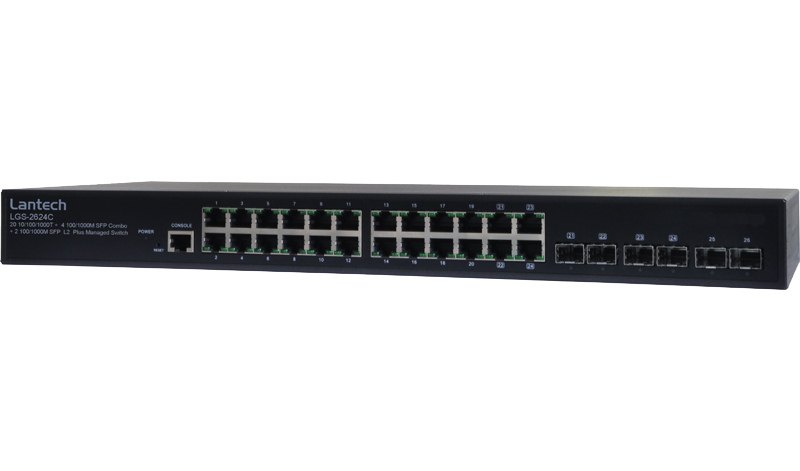 Lantech LGS-2624C-DNV is a 20-port 10/100/1000 Base-TX + 6 100 /1000M SFP L2 managed switches which supports full SNMP features, including QoS for 4 queues, 801.q VLAN, IPv6, IGMP snooping and query mode as well as SNTP and SMTP. The switch features advanced security function including SSH, SSL, RADIUS and TACACS+ authentication, PVE, ACLs as well as supports IP Source Guard to anti-fake DHCP server or illegal IP address to access the network. With advanced SNMP and security function, LGS-2624C-DNV is the best switch to connect with IP Camera, Setup box, VoIP phone / router, Wireless Equipments for MTU, Transportation or Surveillance applications. The LGS-2624C-DNV meets with the most critical test criteria in DNV Type test directives consisting of MED (Marine Equipment Directive), EMC (Electromagnetic Compatibility Directive) and LVD (Low Voltage Directive) in which vibration, high voltage, compass safe distance, salt mist tests, humidity etc are conducted to ensure the switch sustaining the harsh on-board environments often founded in Ships, Crafts and Offshore platforms. *probes, and line tap technologies. Rate Limiter The Rate Limiter Level from 1 to 16 that allow user to set rate limiter value and units with pps or kbps. Cable length detection Adjusts the signal strength based on the cable length. Reduces the power consumption for cables shorter. Port Mirror Supports TX/RX/Both packet mirror.